All around the world there are businesses failing. In the United States alone, almost 200 businesses fail every day of the week! You may see companies that are doing great, people prospering, and business booming. But don’t kid yourself. There are also markets that are collapsing, industries that are disappearing, and a constant flow of bankruptcies. Why do business have problems? Why do good intentions turn into failure? What could drive you out of business? Here are three reasons that your business could fail this year. Many business professionals are running their business as usual. They market, they sell, and they deliver their goods and services. Unfortunately they haven’t taken the time to strategically design their business model. They do things because that’s the way they have always done them, or because fate led them in that direction. To be successful today, that way of thinking just isn’t good enough. You must take the time to evaluate three factors, and then design a business model that will serve you well moving forward. First, what is the value you deliver? Maybe you sell books, but the real value you deliver is information, knowledge, solutions to problems, or entertainment. People invest in your products and services, but they are buying the true value you deliver. Once you understand this concept you are in a position to make your offer so compelling that most prospective clients will not be able to refuse you. Second, to whom do you deliver this value? This is your target market. It is important to know who is best suited for your value and who will benefit the most from it. It’s a matter of efficiency. You don’t have the financial resources, or the time to try and market to sell everyone. If you can clearly define who is best served by the value you deliver, then you can focus on that group and increase your success rate. Third, how do you deliver your value? The “hows” become your products or services. 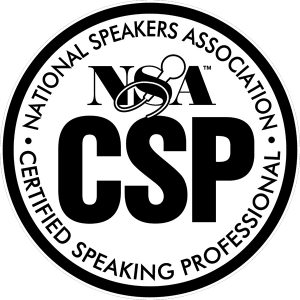 A professional speaker sees himself as a “speaker.” In other words, they just speak for a living. Once that professional speaker realizes that the value they deliver is knowledge or information, then they can realize that speaking is only one way of delivering that knowledge. Speaking is one of the “hows.” Books, audio CDs, video learning systems, and the internet all become additional ways of delivering that same value to their marketplace. Take the time to determine the real value you deliver. You may wish to ask your clients. It may surprise you what their response is. Then determine whom you deliver it to and list all of the other possible “hows.” From this information you can create your own business model. You really are only as good as the people you work with. Your suppliers, employees, peers, and anyone else you rely on can have a major impact on the results you achieve. You only have to think about the busy sales professional that almost misses a deadline to submit a significant proposal to realize that the assistant who reminded the sales pro of the pending deadline to realize how true this is. The old expression; “No man is an island,” is very much the truth. All business professionals are dependent on the people they associate themselves with, both inside and outside their companies. Do you have a great team around you? Are your suppliers making you look good or bad? Do you have wonderful customers? Are they referring you to their peers? As you can see, your success is going to be impacted by everyone you associate with. 3. You Do Not Have a Dream Big Enough To Attract Others. Dr. Martin Luther King said, “I have a dream.” President John F. Kennedy said, “By the end of the decade we will put a man on the moon and safely return.” These were bold statements, but they were dreams that were big enough to attract others to their cause. As an individual, you only know a limited number of people. You only have twenty-four manhours in a day. Your knowledge base contains a set amount of information. Ultimately, alone you can only accomplish so much. By bringing in others to help you achieve your goals you expand, the time, energy, knowledge, and resources that are available to tackle your dream. Dream big, and make it big enough to attract others, because they will help you along the way. Your goals will be reachable and the results you achieve amazing. Don’t fall into these three traps, and you will be on road to Building a Better Biz!